The My Events page contains a list of all your active events. These are events that are upcoming, ongoing or that are less than 7 days old. You can also find archived events in their own tab. You can view the details of an event by clicking on the name of the event. After this you can edit the event, view the participant list, create reports, etc. Please note that if you don't see any options under Create event in the menu on the left, you have not yet selected an event to view. To modify an event, click on the name of the event or the pencil icon on the right. Show: which information is shown on the Events page? Time, venue, address, languages, etc. Event categories: Your company's event categories are listed here. Select which ones you want visible on your event page. The events are categorized into four sections: Favourites, Active, Past and Archived. If you select an event as favourite by clicking on the star in front of the name, it will be shown first. Search for events: Note that the event search will only include events you've set in section 2 to be shown on the page. The gear wheel or settings icon allows you to delete, edit or copy the event. Note that if your event has payments or has been shared to you, you can't delete it. Lyyti automatically shows the name of the event, has it been shared with you and if the event chargeable. Select which event categories are shown on the My Events page. An automatic colour is given to each event category to help you discern between different event categories. In the calendar view, you can hide events that you don't want to see in the calendar. Click on the event and select Hide from calendar. View all hidden events by clicking Show hidden. This is a temporary setting for viewing hidden events, it does not the remove the setting itself. To unhide / show permanently all hidden events, click Unhide events. View events as a list or as a calendar. The calendar view shows you at a glance, when you have upcoming events. Events are automatically divided in four separate tabs: Favourites - Active - Past - Archived. You can add an event as a favourite by clicking on the star in front of the event name. You can search for events here. Note that only the event categories you selected in step 2 are visible here. By clicking the arrow next to the event name, you can go directly to the event's messaging or reporting sections. 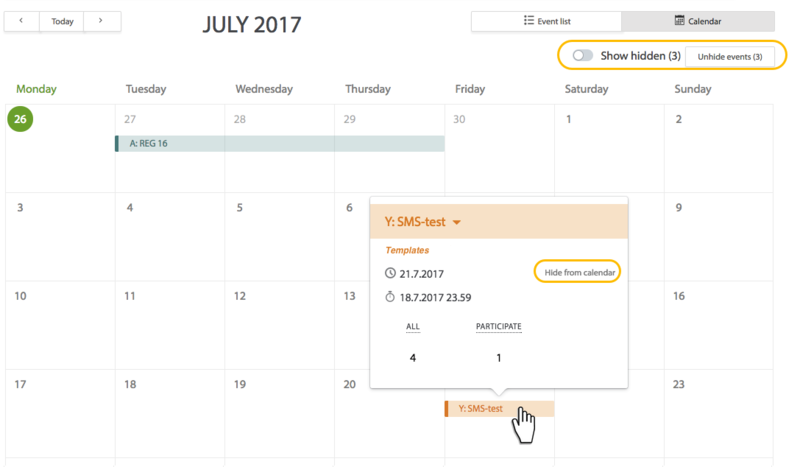 The Dashboard view will show you your next 3 events, and the most recent registrations to events or questionnaire answers.